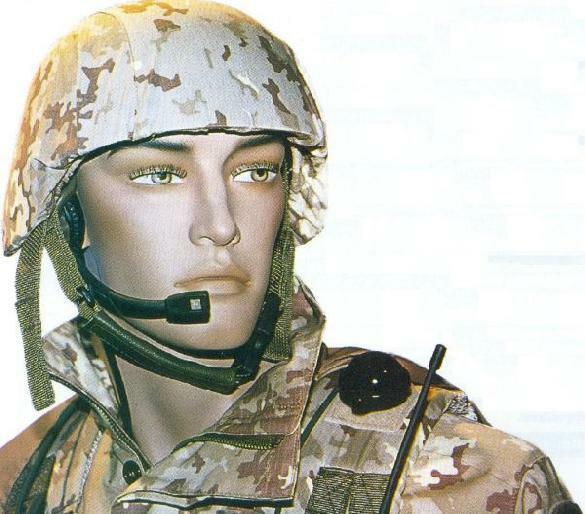 --The Italian soldiers enter the future— The project known as COMBATTENTE 2000 ("21st Century Fighter") was born in 1999 under the request of the Joint Chiefs of Staff Committee; in July 2001, the Italian Government approved the 4-years Research-&-Development project, with a starting budget of 17'000'000 Euros. The program has hence been renamed SOLDATO FUTURO ("Future Soldier"), and it's now on its path, fully respecting the day dates: in April 2004 the first Technology Demonstrator has started to undergo its trial tests, while the definitive prototype should be ready for first field deployment at the end of the year 2005. Italy thus joins those countries (such as USA, UK, France, Germany, Netherlands, Australia, Canada and South Africa) which have started a technological research program to enhance the individual soldiers' capabilities on the battleground. The operational requirements of the close future require a drastic enhancement of in five areas: Lethality, C2 (Command-&-Control), Survivability, Mobility, S&A (Support-&-Authonomy). Furthermore, to increase the procedure of digitalization of the area of operations, it's necessary to achieve full integration of the individual fighter and the platoon in the both national and international Command-&-Control chains. To achieve those goals, and to make up for the delay respect to the other Countries which have similar projects, the Joint Small Arms Directorate of the Italian Armed Forces, responsible for the development of this program, has founded a Program Direction Committee, composed by: one program director from the JSAD and various representatives of the Army Staff and Logistic Department, including members of the General Secretariat of the Ministry of Defense, General Defense Directorate for Communications and Advanced Informatics, General Defense Services Commissariat and Direction, General Directorate for the Military Health, Defense Research-&-Development Watch Committee. The Program Direction Committee is also composed of high representatives of the industries which are taking part to the development of the program: MARCONI-SELENIA for a wide array of components including the communications system and the high electronics technology, GALILEO AVIONICA and LARIMART for the Command-&-Control enhancement system, AERO-SEKUR for the NBC protection, SISTEMA COMPOSITI for the ballistic protection, and ultimately BERETTA for the small arms. The purpose of the project is to create a "soldier system" which should be open, modular, flexible and prone to be rapidly re-configured to fit the future technological implementations and the operative readiness' necessities of every situation, and to be compatible with the systems of other allied Countries. Is not a case if MARCONI-SELENIA, leader industry in this group of companies working for the enhancement of the Italian fighter, is taking part to an international NATO working group known as SSSIWG ("Soldier System Standardization Industrial Working Group"), which purpose is to study all the industrial procedures which might lead to the highest level of standardization and compatibility between the Soldier Systems of all the allied countries. The tasks of the SOLDATO FUTURO program are the same ones of the NATO working group AC225 / TOPICAL GROUP 1. BASIC EQUIPMENTS The Technology Demonstrator currently undergoing trial tests is made out of a series of working components, software and study Mock-Ups to verify the ergonomics and the bulk of the system; many of those parts will undergo several modifications during the development of the system. As in the example: the ultimate dimensions of the Display which will be issued to each rifleman are still to be exactly set, and so is the physical position of such display and of the C2 computer on the system. The Technology Demonstrator is being developed in three variants: Platoon Commander, Rifleman, Grenadier. Each one of these three variants have something little different from the other ones, but the "system" will be completely common. The base element of the system is the C2 (Command-&-Control) system, engineered by MSC (MARCONI-SELENIA COMMUNICATIONS) in cooperation with GALILEO AVIONICA (which has engineered the software) and LARIMART (the maker of the hardware): this last component is composed by an extremely compact wearable computer, its dimensions aren't much larger than the ones of a packet of cigarettes, and by a 4" LCD Touch-Screen, which will be fixed to the left forearm. The Command-&-Control functions are accomplished via the exchange of information messages (which can be in "normal" or "zipped" format) or graphical indications; the orientation and navigation of the individual soldier and the platoon will be made easier by the use of digital cartography, aerial mapping and use of satellite images, along with a GPS terminal. Two configurations of this system will be available: the Platoon Commander one will have a wider display than the one given to the Rifleman and Grenadier configurations; the necessity to observe with extreme definition the tactical layout of each commander's team, in fact, suggests for an update in the display dimensions. The voice and data trasmission will be instead mamaged by the extremely compact MARCONI-SELENIA's Individual Pocket Radio, which can be operated within a range of 1300 Meters; it will be equipped with a sophisticated miniaturized radio earphone/microphone made by LARIMART; each earphone will be equipped by a Phisiological Sensor made by GALILEO AVIONICA, which will allow the Platoon Commander and the Central Operations Command to monitor the phisical/health status of every single soldier. FUTURE FIREARMS The individual armament is based on a new BERETTA assault rifle, chambered for the .5'56x45mm-NATO, which will be equipped, in the Grenadier system configuration, with an underbarrel-slung 40mm grenade launcher. The rifle optic (actually it's more an optronic system on its own) and the Fire Control System for the grenade launcher have been developed by GALILEO AVIONICA. The working mechanism of the rifle is based on the tried-and-true one of the currently issued BERETTA AR-70/90 individual weapon, thus on the well-trusted AK-47 system. The cocking and hold-open levers, the magazine release button and the spent cases ejection port will be completely ambidextrous, thus making the gun immediately operational for left-handed users. One of the main tasks for the development of this new assault weapon is the reduction of weight and bulk. The "body" of the weapon will be composed of a shell of high-impact polymers, thus protecting the internal working system from dust, rust, water, and other "aggressives" which might cause jammings and/or malfunctions, hence making the gun basically "soldier-proof" and "idiot-proof", furthermore the gun will weight 25% less than the currently issued AR-70/90 assault rifle. The futuristic lines of the gun are in fact inspired by the newest CX4-STORM carbine made by BERETTA, its configuration will be extended with the use of a multi-position telescopic stock equipped with a cheekpiece, very important to adapt the use of the gun not only to the built of every single soldier, but also to the use of the gun along with the several configurations of the system, including the NBC protection layout or the extra ballistic protection means that may be deployed when it's required to. The fire selector switch has a familiar "round" shape to be easily reached and operated by the gunman, and has four positions: Safe, Single Shot, 3-Rounds Burst, Full-Autofire. The nagazine release lever is also easy to reach and operate, it's placed between the trigger guard and the mag well, pushing it towards upside, the magazine of the gun is released (the assault rifle will feed basically by the standard 30-rounder STANAG 4179 magazine, but will also take Beta-C Mags and other STANAG compliant magazines). The total lenght of the weapon it's also reduced respect to the BERETTA AR-70/90, it will be 900 Millimeters with stock full open against the current 998 Millimeters. Longer, heavy barrels for sharpshooters and carbine versions will also be available, thus to equip every single soldier according to his "specialty" and to the tactic needs of the moment. ELECTRONIC EYES The optronic aiming system (called ICWS, engineered by BERETTA and GALILEO AVIONICA) is part of the small arms subsystem. The ICWS is a complicated optic-electronic aiming system which will allow the soldier to discover, identify and engage targets on distances much beyond the capabilities of the enemy (and of the soldier of today in general), in all weather and light conditions, both in night and day. A red-dot aiming module is used for the istinctive fire; it's mouted on the upper part of the sighting module, which anyway has 3 other sighting channels, namely a non-cooled thermal camera, a traditional optic with fixed sighting reticule and a digital camera. 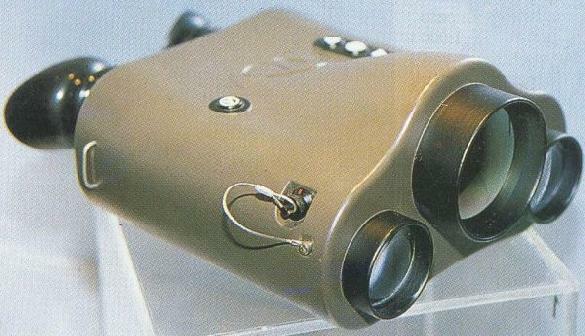 All of these sighting channels can be used towards a single monocle, the camera allows the user to engage defilated targets both in night or day via transmitting the image of the target directly to the soldiers' display. It is also able to make "snapshots" of the situation and send them to the computer of the Platoon Commander or directly to an higher position in the Command-&-Control chain; the images/data transmission from the IWCS to the C2 system (display included) happens via Wireless, and the system has been developed by GALILEO AVIONICA and LARIMART. The IWCS is also equipped with a laser sighting module which can be switched from a visible beamshot to an Infra-Red laser beam which can be seen only with Night Vision Modules. The traditional 3x optic is instead there as a back-up sightins system, since it doesn't requires batteries to operate.The complete weight of the IWCS is approximately of 1 Kilogram; despite of the multiple functions it fulfills, the bulk of the entire system is surprisingly compact, especially if you think that it's entirely Made In Italy. The power source of the IWCS system is a group of rechargeable Lithium Ions batteries, and the IWCS can be mounted on the rifle, or took out of it, with a simple operation since it's placed on the upper part of the weapon with a standard Picatinny rail. There are three more small rails under the handguards and on its sides, to allow other accessories to be attached. To integrate the rifle with the Grenadier system layout, the weapon will be equipped with a single-shot, underbarrel-slung BERETTA grenade launcher of special new development, chambered for the standard 40x46mm-SR grenades, which tube opens by slinding forward then tilting to the right, such as the German AG36, so that the grenade launcher will be able to fit even the oddest loads and longer shells, such as the riot control ones when the gun is needed to be used in Less-Than-Lethal situations. The complete weight of the grenade launcher should be approximately of 1 Kilogram, and there will also be a stand-alone version of it, equipped with telescopic stock and pistol grip. FIRE CONTROL SYSTEM In order to enhance the potentialities of the Grenadier system setup, GALILEO AVIONICA went out with the GLFCS (Grenade Launcher Fire Control System), a complete control platform able to give to the Grenadier the exact coordnates to deliver indirect fire at any target, moving or standing, which use is very simple: simply pressing a button, a built-in laser rangefinder measures the distance between the soldier and its target in less than one second, a ballistic computer calculates the exact grenade launching angle depending from the kind of ammunition used at the moment, and a system of leds and a crosshair in the IWCS indicates to the Grenadier the right position to fire; it even indicates the correct position respect to the pitching axis of the shooter, thus guaranteeing an high possibility of first-shot-hit. Should instead the target be moving, using HEDP Dual-Purpose grenades, the user would just need to select the "Moving Target" option on the GLFCS and point the laser rangefinder at the target for approximately two seconds, so that the ballistic computer calculates the correct shooting angle and provides to the Grenadier the exact impact point via the crosshair. The GLFCS weights 250 Grams, it is placed right on the grenade launcher and is powered by lithium rechargeable batteries; it is actually the first ever REAL Fire Control System mounted on an assault rifle in the entire world, exception made for the FCS developed by MEOPTA of Norway for the Belgian FN F2000 modular bull-pup assault weapon, but the MEOPTA FCS only gives to the grenadier the exact elevation for static targets on one axis only. The third element, which will be deployed only on the Platoon Commander system layout, is the UAB, UNITA' ACQUISIZIONE BERSAGLI (Target Acquisition System), developed by GALILEO AVIONICA, this being a system all in all similar to a common binocular. It's a multipurpose night/day watching system employing a non-cooled infrared thermal scan camera, a daytime telescope, a class-1 laser rangefinder and a digital compass. Other than the digital target acquiring, the UAB can acquire targets via the "Record data" System, this being a "registered" image with target coordinates overprinted on it (distance, bearing, elevation); this image can be acquired by the soldier's individual computer, via wireless connection, and forwarded to superior levels of the Command-&-Control chain. The weight of the UAB, powered by rechargeable lithium batteries, is of 1800 grams. TECHNOLOGIC CLOTHES The "clothing and protection" subsystem has been developed by SISTEMA COMPOSITI: the helmet has enhanced ballistic protection, being it made in last generation aramidic fiber; its design is optimized not only to ensure an enhanced head protection but also to integrate in itself the audio-radio transmission system (headphone/microphone) and to be equipped with a frontal attachment for night vision monocles and head-up displays, which will be in the future made available by GALILEO AVIONICA adopting a third generation tube. Furthermore, according to the necessities of each mission, the helmet will be equipped with several kind of bullet-proof vizards and built-in anti-laser googles. The individual armour will be set on a modular basis, consisting on a "base" light armour with anti-shrapnel and anti-blade purpose, which will provide ballistic protection only for small bullets, up to the 9x19mm caliber; but the ballistic protection will be increased according to the missions requirement by adding on protective plates made in polyethilenic/aramidic fibers, or in an alloy of ceramic materials and boron carbide which will ensure protection up to the well-known, heavy 7'62x54R caliber, even with AP or SLAP bullets. The clothing combinations are also undergoing a phase of heavy Research-&-Development, from the under-suit to the underwear, trying to achieve the highest levels of lightweight, comfort, insulation and transpiration, all of these being requirements that can easily be fitted by the use of the most modern synthetic fibers. The combat combination (read: camo suit) is another story, the main goal to be achieved in this field is the lowest possible visibility, this both exploiting the camouflage with the surrounding environment or the use of anti-detention fibers; the suits will also have an high NBC protection factor, this will be achieved by using fibers soaked in activated carbon. 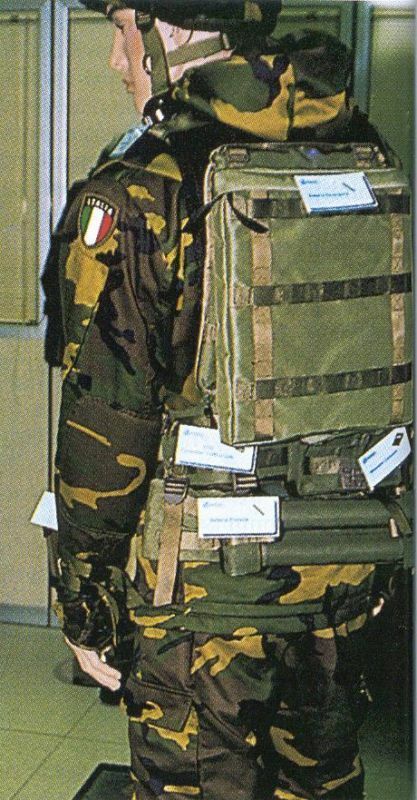 A special jacket will also be deployed to host all the necessary cable links for the system, this garment will ensure correct apportion of the loads and subsequently the highest levels of system-equipments integration: this will be the MUS (MODULO SUPPORTO UNIVERSALE, "Universal Support Module"). Developed by LARIMART, its main task will be to ensure proper power source and recharge of the components of the system, and its configuration can be set each time according to the mission necessities, loading it with battery packs of different bulk. For the foot-based soldiers and long missions, the battery pack will be powered by an exceptionally light group of methanol-based fuel packs; all the systems, anyway (UAB, ICWS and GLFCS) can be recharged either from the battery pack or from any direct main power source as there are many available on every military vehicle, ship or plane. The new NBC protection mask has been developed by AERO-SEKUR, this will have a side-placed filter, frontal drinking straw and polyurethane-made face pack, lighter and improved respect to the currently issued M90 masks. The lenses have been selected with a particular care, to guarantee the highest levels of clearness and the lowest levels of distortion, this factor is in fact crucial to avoid problems when using optical instruments. AN ALL-ITALIAN PROJECT The general configuration of the system has been determined, but it's not yet the ultimate one, the project is in fact still open to the modifications and implementations which may be suggested according to the results of the undergoing tests; the "Italian approach" to the system is pretty clear anyway. The budget of the program, though being pretty high, cannot be compared with the ones planned for similar programs by other countries such the USA, in spite of this it's encouraging to see that Our system has shown a number of completely original qualities and distinctive features, all of this supported by the total use of entirely "national" high-level technologies. Take the example of the American counterpart project, the "Land Warrior": it was officially born 15 years ago, but the "Initial Capability" version will be made avaialble only at the beginning of 2005. Even supposing that Italy has really a delay respect to other similar programs, such as the German one (which will be already displayed in 2004, 1600 "pieces" will be by now destinated only to the Special Forces), we must remember that the program was officially born only in 1999, and started in 2001. There has been a strong attempt to use as much tried-and-true technologies as possible, in order to reduce risks and costs, but this hasn't stopped the developers of the project from coming out with a series of completely new systems, such as the Grenade Launcher Fire Control System. Another "unique" feature of the Italian system is the wireless link between the IWCS aiming module and the soldier's display, since in ALL of the other similar programs in the world (even the American "Land Warrior") such a link is still via cable. ---- PICTURES INDEX ---- 01 = The .5'56x45mm-NATO Individual Weapon created by BERETTA for the Program; the working system of the pictured sample isn't actually of the newest generation, being it a tried-and-true AR-70/90 \ AK-47 system; it's enclosed in a protective all-polymer shell and features a telescopic stock; it has an underbarrel-slung 40mm grenade launcher of new BERETTA conception, equipped with a Fire Control System developed by GALILEO AVIONICA. 02 = A close-up of the System in desert tan as shown at the latest EUROSATORY expo. 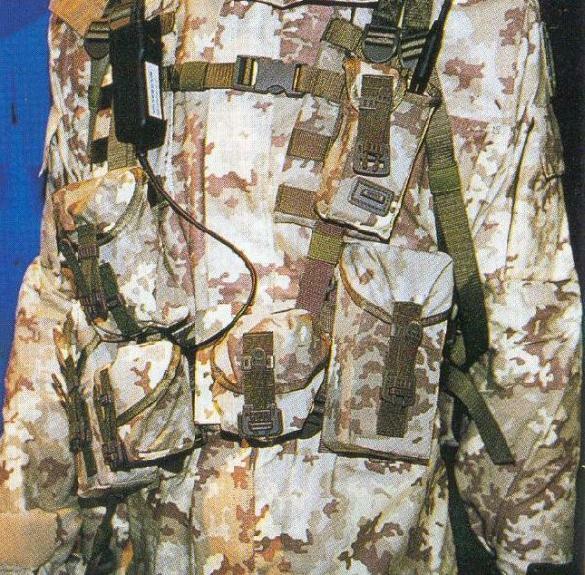 03 = A complete vision of the SOLDATO FUTURO system, mounted on a manikin; this is in just one of the camo tan layouts undergoing trial and evaluation; the tissue will have low IR visibility. 04 = The forearm-mounted 4" display for the "Rifleman" system layout. 05 = A complete gallery of the C2 system elements. 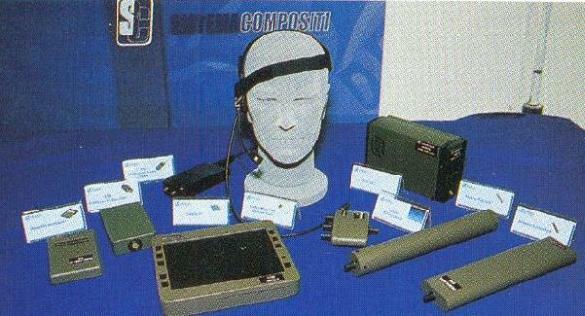 From the left to the right: Wearable Computer; CTD device (CONTROLLO TRAFFICO DATI, "Data Traffic Controller"); 8" forearm-mounted display for the "Platoon Commander" system layout; Earphone-Microphone radio transmission system, with built-in "physiologic sensor" which monitors the health conditions of the single soldier; distribution module; fuel-cells battery pack; cylindrical primary battery; secondary battery. 06 = Rear view of the system, with secondary battery backpack subsystem, the system computer and the cylindrical two-batteries secondary power source. 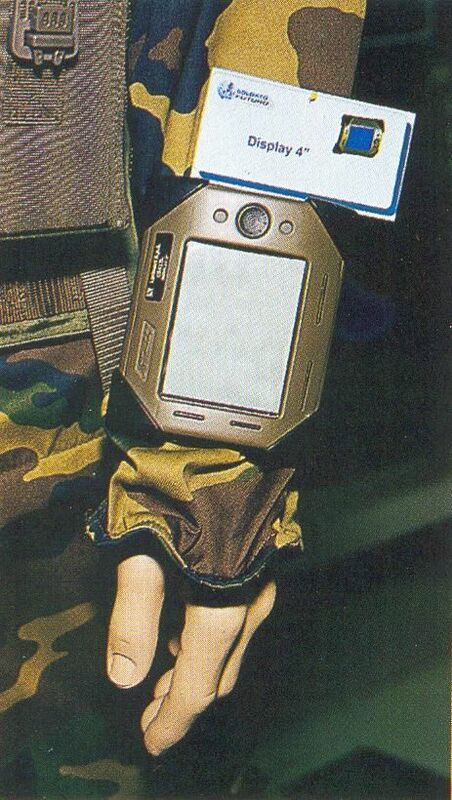 07 = Close-up of the Universal Support Module; the antenna of the Individual Pocket Radio, with a range of 1,3 Kilometers, protrudes from the upper left pocket. 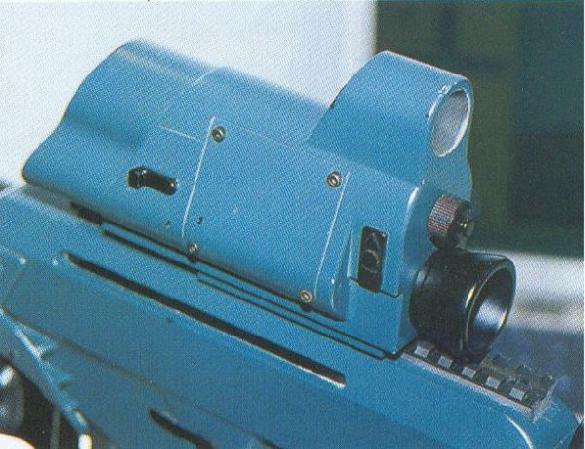 08 = Close-up of the ICWS optical sighting system made by GALILEO AVIONICA, mounted on the individual weapon. 09 = Close-up of the UAB, Targets Acquiring Unit which will be issued only to the "Platoon Commander" system layout. It can spot a man hidden up to 1 Kilometer in distance, and can identify a tank up to 2 Kilometers far away, and has an average weight of 1,8 Kilograms. 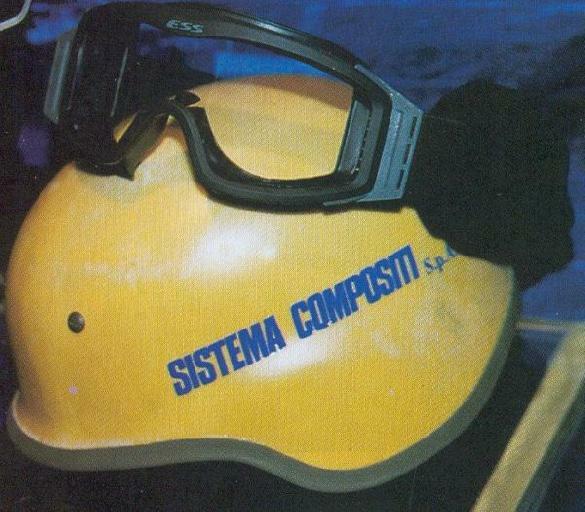 10 = Close-up of the helmet as developed by SISTEMA COMPOSITI, made by last generation aramidic fibers, thus achieving a major reduction in weight. The combat googles as shown have a ballistic protection factor which will stop up to 12-gauge rounds. For Urban Combat situations it can have a lighter frame, but will anyway be equipped with bulletproof and anti-laser lenses. 11 = Complete view of the system in desert tan camo. The chromatisms and the colour scheme are generated by the computer in accordance with a precise algorithm. The suit touches the highest levels in wearability and comfort, and ensures a very low visibility. Other camo layoutsa will obviously be avaialbe according to the necessities of each mission.